MobiLock Content Management (MCM) is one of the frequently used add-ons. This service helps you distribute your enterprise content in a safe and secure manner to your MobiLock managed devices. MCM service comes with 50MB, 100MB or 200MB bundles, but sometimes the space might not be enough to push your enterprise content, as you might be having a large training video or you might want to use MCM in Presentation mode where there are multiple large marketing videos. To address these use-cases, we have allowed you to use your Google Drive files to be distributed via MobiLock Content Management. 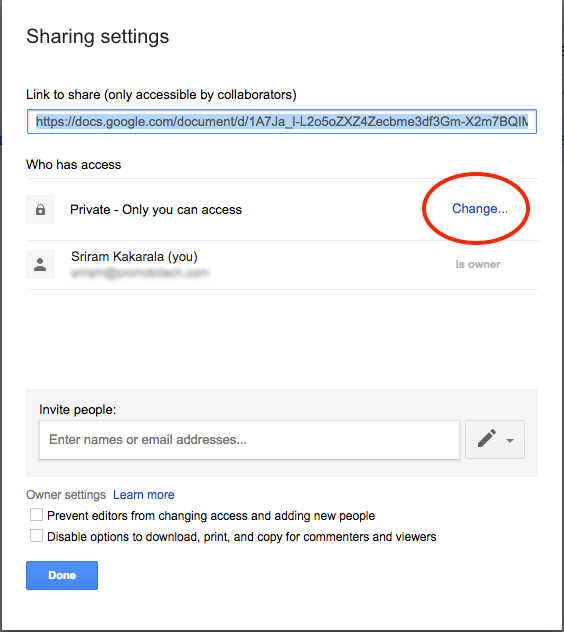 This document guides on how to upload/link your Google Drive files to MobiLock Content Management. On the MobiLock Managed devices you would need the latest version of FileDock on Android devices and on iOS you would need the latest version of MobiLock iOS Agent. This feature is currently supported only on Android devices. We are working on the iOS client and an update will be available soon. Make sure you have an active subscription to MobiLock Content Management (MCM). Make sure you have access to the Google Drive account and the files that you want to publish. Make sure to update your devices to FileDock version 1.4.5-34 on your Android devices. For iOS devices we are updating our client and an update will be available soon!! MCM is paid add-on service post the free trial period. Navigate to the folder and right click on the file that you want to publish via MCM service. You can leave the access permission at it’s default that Can View. 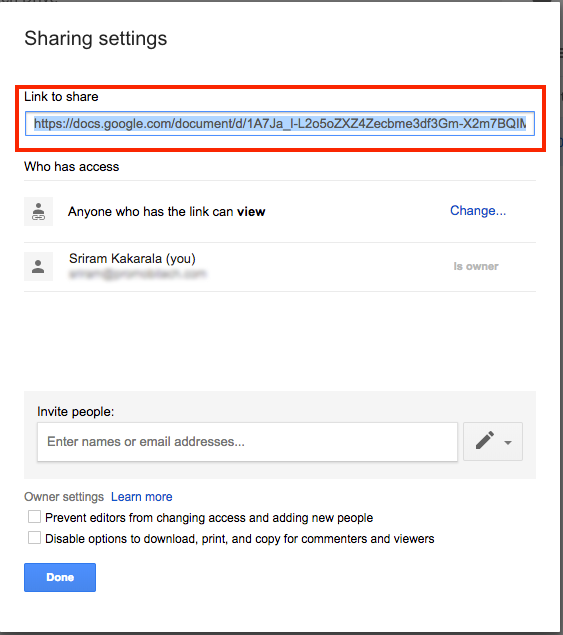 Now copy the url link of the file that is shown in Link to Share box. At this point, MCM tries to fetch the details of the file. If it succeeds then the file information is shown as shown below. Note that we cannot fetch the size of the file and hence it is shown as 0 bytes. If the file format is not supported OR if there is an error then an error is displayed. Once save, this file will now appear on your Dashboard. From this point you can publish/un-publish this file to your devices and groups like you do with a locally uploaded file. On the devices's if the latest version of Android FileDock and MobiLock iOS agent* are installed, then the files will be downloaded and displayed like normal files. The file will be opened for inline viewing if possible or using a supported and allowed viewer. Files uploaded using this option are not uploaded to our servers. In short they do not consume your MCM space. You can filter the list of files on Dashboard to quickly see the ones that were uploaded locally or linked from Google Drive. If the Google Drive file is deleted after it is uploaded on MCM, then on devices the downloads will fail. If the Google Drive file does not have the required access permissions as described in the steps above, then neither the dashboard not device can retrieve the file details. Only the following file formats are supported for upload, txt, doc, docx, ppt, pptx, xls, xlsx, pdf, avi, mkv, 3gp, mp4, mp3, wav, 3ga, m4a, aac, ogg, amr, gif, xml, properties, png, jpeg & jpg. Although MCM supports upload of formats mentioned in point 3, FileDock application can natively open certain file formats. You would need 3rd party viewers on the device to open unsupported file formats. Question - Do you need to install the Google Drive App on your device(s)? Answer - No. Google Drive application is not needed. For Android you would need the latest version of FileDock and for iOS you would need the latest version of MobiLock iOS Agent. This feature is currently WIP on iOS and will be available soon. Question - What are the file formats supported when uploading from Google Drive? Answer - The formats that we allow are limited to the file formats that MobiLock Content Management supports. Currently we support the following formats only, txt, doc, docx, ppt, pptx, xls, xlsx, pdf, avi, mkv, 3gp, mp4, mp3, wav, 3ga, m4a, aac, ogg, amr, gif, xml, properties, png, jpeg & jpg. Question - Can I upload links from other providers like Dropbox, Box or OneDrive? Answer - No. Currently we support only links from Google Drive.